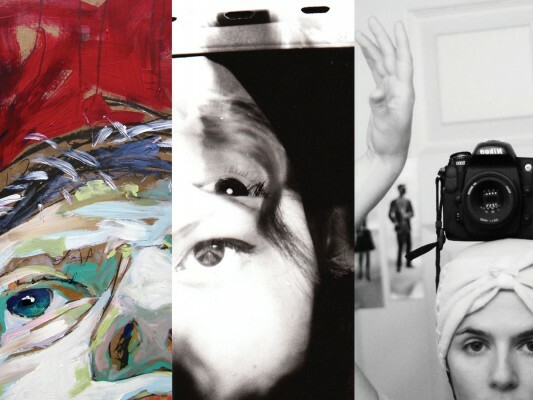 Gallery Gachet presents two distinct projects of self-portraiture: A solo painting exhibition by Leef Evans, and a participatory, critically reflective photo exhibition by Ariel Kirk-Gushowaty and Lisa Walker. Spanning Time: Coinciding Self-Portraits focuses on the work of Lisa Walker and Ariel Kirk-Gushowaty, two photo-based artists who have made use of self-portraiture consistently in their work for over a decade. Both explore the overall effects of long-term self-portraiture including points where their work coincidentally has come together or overlapped. An image of you; photographed by you. A photographic self-portrait necessitates being both the observer and the observed. One part of you is the creator of the image; the other part is the subject. Holding a camera towards you, with the intention to record a genuine moment, to connect and conclude an experience. The self-portrait touches on what it means to be a self-aware being, for the simple act of photographing oneself reveals both consciousness, and awareness of such. Join artists Leef Evans, Lisa Walker, and Ariel Kirk-Gushowaty in making self-portraits. The gallery will be open as both exhibition space and studio. Alongside the artists in the exhibition, experiment with the mediums of drawing, painting, and photography to create self-portraits of your own. The afternoon is a free workshop, open to the public, and materials will be provided. If you would like to participate, please register by email: programming@gachet.org or by phone 604-687-2468.